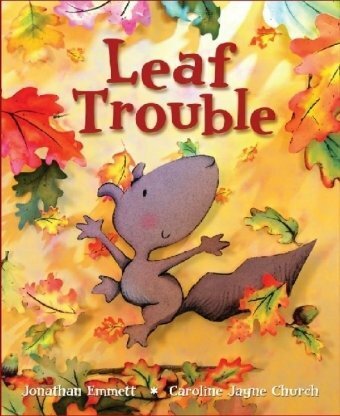 Leaf Trouble is a wonderful story for introducing autumn to young children and it’s a great book to use in the classroom to stimulate discussion about why trees lose their leaves. Before I read the story I ask children why they think that trees lose their leaves in the autumn, their answers are often interesting, one child observed that trees losing their leaves is the same process as him losing his milk teeth! The Story: It is autumn and Pip Squirrel notices that something is happening to the old oak tree that he lives in. The leaves have changed colour and they’re falling off the tree. With his sister Blossom’s help he carries leaves back up to the branches but a huge gust of wind blows even more off. Mum Squirrel explains that the leaves will be back in the spring. Jonathan Emmett has captured the essence of autumn from the very first page when Pip notices a change in the air. Pip’s sense that something is different is heightened when he sees leaves on the ground and notices that they aren’t green any more. He describes the tree as ‘falling to pieces’ and although Blossom and him work hard to try and put the leaves back they’re no match for nature and the wind. 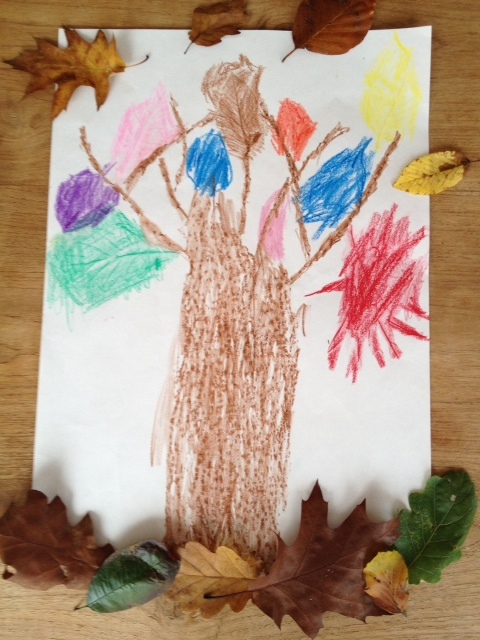 When Mum explains that the tree losing its leaves is normal Pip likens the change with the rising and the setting of the sun and decides that the falling leaves are the same colours as the sunset. It is a beautiful comparison and provides the understanding that Pip needs. The easy to read text includes some wonderful vocabulary e.g. skittered, dropped, drifted, scampered, tickling, trembling and provides scope for vocabulary discussion with older children. Caroline Jayne Church’s illustrations are beautiful, the reds, golds, yellows and browns capture autumn perfectly. The oak tree is old and twisted and we love the way she captures the movement of the leaves when they blow down. The page layouts are all different, some are wordless, others have more text than others. I particularly like the way that the text is laid out on the page where the leaves fall, each word drops individually like a leaf. Inspired by Leaf Trouble we went for a walk in the woods to look for oak trees. As well as oak we found other varieties and talked about the difference between deciduous and evergreen trees. We ran through the leaves and collected bark, twigs and as many different shaped and coloured leaves as we could then used wax crayons to rub them. My daughter had a wonderful time and the idea for this picture was hers. She created her own tree by rubbing the bark, twigs and leaves that we had collected. She started with autumn colours but left to her own devices the tree became a bit more colourful! 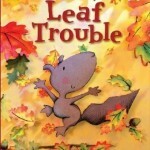 Leaf Trouble is a beautifully illustrated story and it’s a wonderful book to stimulate discussion about autumn. Not sure if it was coincidence or excellent timing, but I saw your post just as I was looking for an indoor activity to do with my daughter two days from now. I promised her handicraft and only afterwards realised I don’t have much material at home. We do have, however, a brand-new box of wax crayons, and we’ll collect leaves on the way home. Your activity ideas, whether directly or indirectly related to book, are always great! Leaf rubbing is one of my favourite autumn activities. We collected conkers today, my daughter asked if she could rub them too! I love your review of the book and the crafting ideas. I must look for it to give to my grandchildren sounds like so much fun! Thanks Lysa, it’s a lovely book for introducing autumn.